President Trump announced some important cabinet and administration moves this week to include Larry Kudlow as Gary Cohn’s replacement as Director of the National Economic Council and after the firing of the country’s top diplomat, Rex Tillerson, CIA Director Mike Pompeo has been nominated as the next Secretary of State. 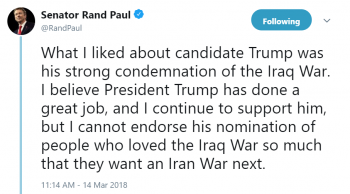 Kentucky Senator Rand Paul has expressed polar opposite views of these picks giving Kudlow full support and Pompeo and Trump’s pick to replace him, Gina Haspel not so favorable a review, in fact, he vows to oppose the nominations. 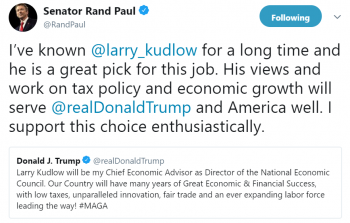 Dr Paul said concerning Kudlow, “I’ve known Larry Kudlow for a long time, and he is a great pick for this job. His views and work on tax policy and economic growth will serve President Trump and America well. I support this choice enthusiastically”. On Wednesday, Paul said he was concerned about Director Pompeo’s bellicose, interventionist foreign policy, which might take us back to war in the Middle East, as well as his previous statements on so-called “enhanced interrogation techniques” and his desire to empower the surveillance state.